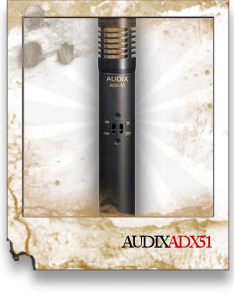 Characterized with a uniformly controlled cardioid polar pattern, the ADX51 is designed to capture the acoustics of the instrument being miked while at the same time isolating it from the rest of the instruments on stage. With a wide frequency range of 40 Hz - 18 kHz, the ADX51 is equipped with an optional -10 dB pad and bass roll-off filter for added contour and control at the sound source. The ADX51 is very easy to position, durable and manufactured with high standards and tight tolerances. Roadworthy construction includes a precision machined brass body, black e-coat finish, laser etched model and serial number, steel mesh grill, gold XLR connector and a tension-fit heavy duty nylon mic clip.